This southwestern quinoa salad is packed with fresh, colorful, crunchy vegetables, black beans, quinoa and tossed in a zesty lime cumin dressing. It’s a healthy, delicious salad that everyone will love. I’ve been kind of obsessed with the southwestern quinoa salad recently. I went to a new restaurant with friends and had this salad. It was so good – I knew I wanted to recreate it and share it on the blog. I love that it’s packed with colorful, healthy vegetables and has a large amount of protein from the black beans and quinoa. It has a zesty lime and cumin dressing that really works well with all the flavors in this salad. Start by cooking your quinoa according to the package instructions. Once the quinoa is ready, turn it out onto a baking pan or dish to cool slightly. This will help it remain light and fluffy. While the quinoa is cooking, chop up all your veggies and add them to a large serving bowl. Add in the corn and black beans and toss to combine. 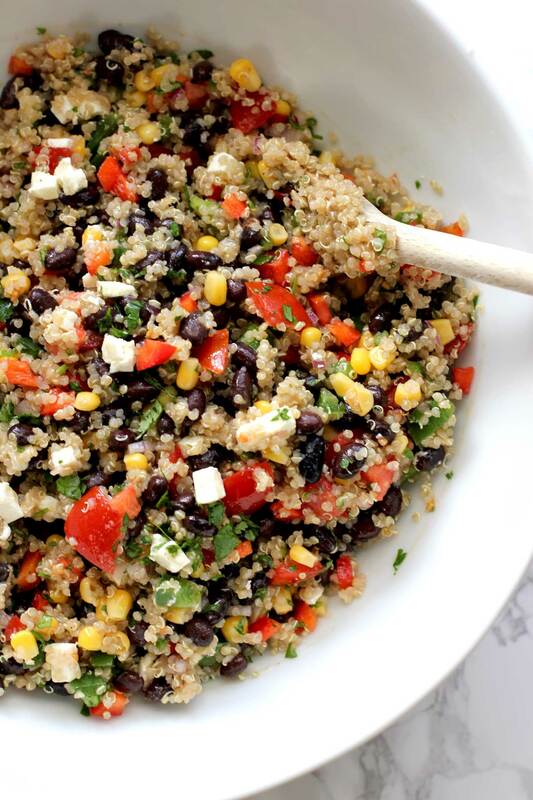 Next, add in the cooked quinoa, feta cheese, cilantro and the dressing – toss to combine and you’re ready to serve. 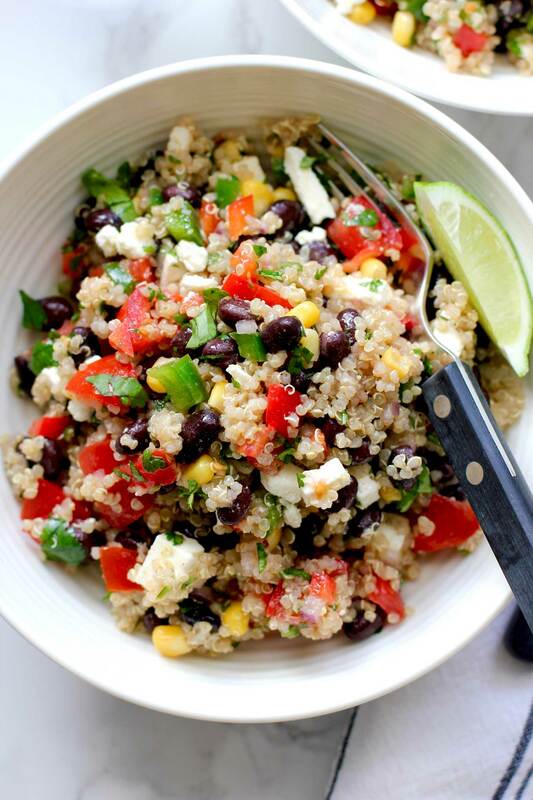 This southwestern quinoa salad holds up really well for a couple of days. I usually make a large batch on Sunday and then pack it up in separate containers so it’s ready to grab and go in the morning when I’m running out the door. You can serve this as a main dish or a side dish. This is a crowd pleaser – so make a big batch to bring to your next potluck. If you don’t like cilantro you can switch it out for minced parsley. Want to stay in touch? 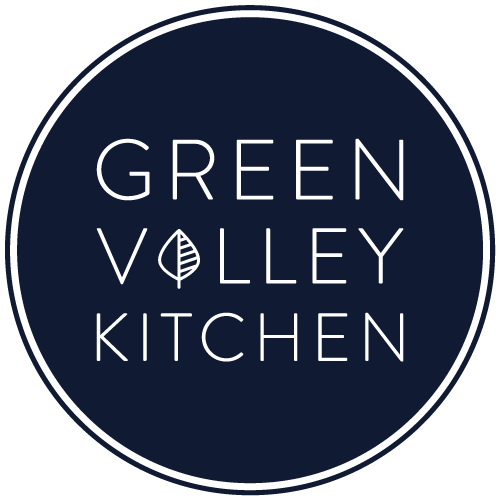 You can subscribe to receive free recipes or find me on pinterest and instagram too. If you make this recipe and enjoy it, please come back and leave a comment and a rating. I’d love to hear from you! Cook quinoa according to package instructions – mine took 15 minutes to cook. At the start of cooking the quinoa, as the water begins to boil, I added one veggie bouillon cube. 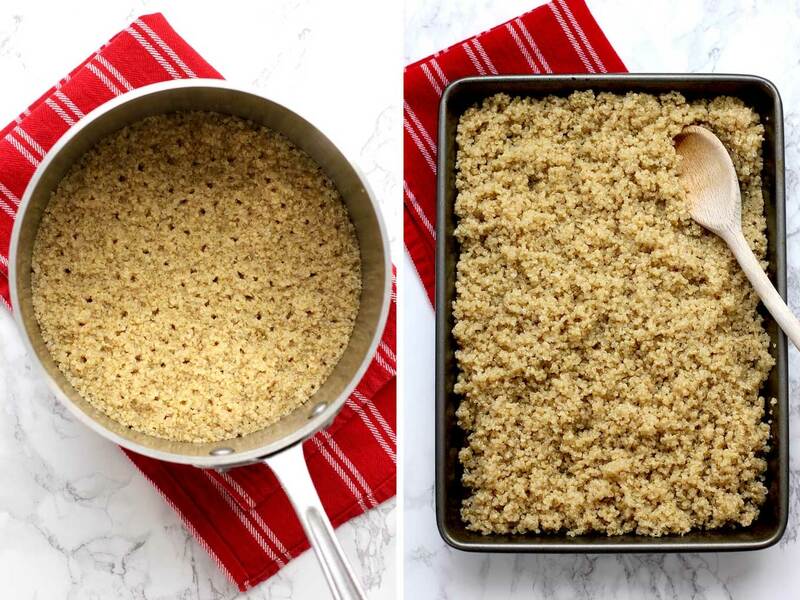 When the quinoa is done cooking, pour it out onto a baking sheet to let it cool slightly. This will help the quinoa to remain light and fluffy. While the quinoa is cooking, prep the veggies. Dice bell peppers, tomatoes, red onion and jalapeño pepper and add to a large bowl. 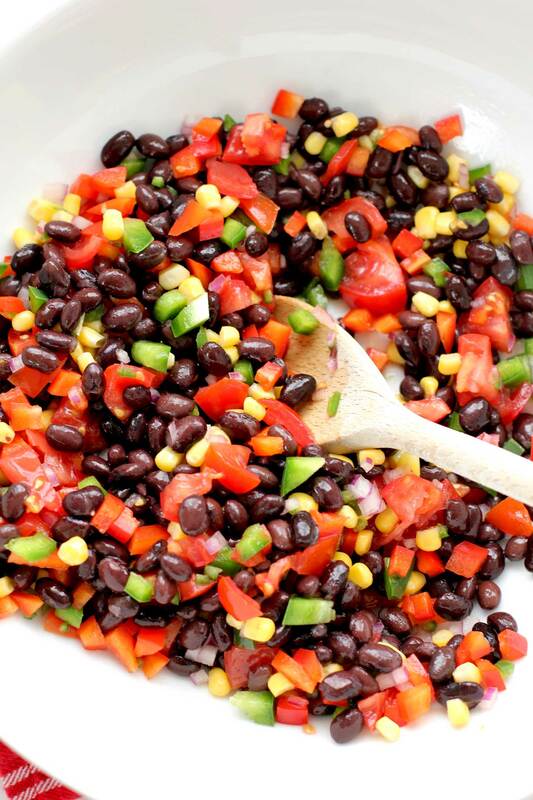 Add black beans and corn to the bowl. Stir to combine the veggies and black beans. Add slightly cooled quinoa to the veggies and stir to combine. Make the dressing by whisking all the ingredients together. Add cilantro, feta cheese and dressing to the quinoa mixture and toss gently to combine. I removed the seeds from the jalapeno since I don’t like things too spicy. Leave them in if you want the extra heat. If you make this recipe and enjoy it, please come back and leave a comment and a rating. I love hearing from you! Is the nutritional value for the whole salad or 1/4 of the salad? Hi Phyllis – the nutritional info is for one serving. The recipe makes 4 servings. Hope you enjoy it if you make it. Whoa! I so thought I commented on this beauty! I love anything southwestern and this dressing is giving me all the feels! Delicious offering, my friend! Absolutely delicious and everything comes together so quickly. Love the lime and cumin dressing, something different. Thanks, Mom! This is a good one to share with Bonnie and Rob! Absolutely love all the flavors you’ve packed into this hearty salad, Geraldine…. And I love this type of salad. Make ahead and lunch is ready all week! Hooray! Thanks so much, Traci. Definitely a great make ahead lunch – my favorite kind of salad! Love the flavors here Geraldine. I’m always up for a delicious quinoa salad loaded with all the healthy ingredients my diet needs right now! Thanks, Mary Ann – hope you try it! 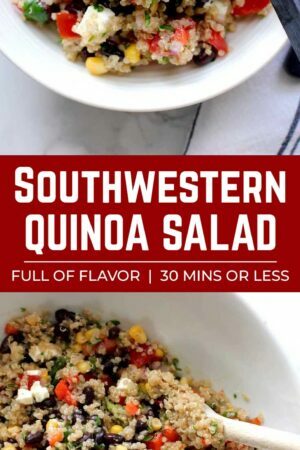 I absolutely love southwestern ANYTHING and I adore a good quinoa salad, so this beauty is screaming my name!! I can see this happening in my kitchen in the immediate future!! Pinning! Cheers, dear! Thanks so much, Cheyanne – and thanks for the pin -you’re the best!